The first University of Miami player ever to have his jersey retired (No. 20), Orlando Gonzalez has gone down in the UM annuals as the team's best all-around first baseman. A .300 hitter out of Dade South Community College, Gonzalez hit .338 and stole 34 bases in his first season with the Canes. He followed that performance with a banner senior season. He slugged his way to a .402 average and stole a then NCAA record 62 bases. His aggressive style at the plate and on the base paths led the Hurricanes to their first-ever College World Series, where Miami finished second to Southern Cal. who that year won its fifth-consecutive CWS title. Following that College World Series which saw "Big O" drive in seven runs with his seven hits, he became the first recipient of the annual Lefty Gomez Plate Award as the outstanding player in collegiate baseball. He was named to the College World Series tournament team and as an All-American selection by Sporting News and the NCAA coaches as well. Although not a power hitter--as a lefty shooting against long right field fences he hit but two homers in 1973 and one in 1974-- Gonzalez did have the tools of a fine baseball player. He combined overall hitting with great speed and quickness. He also was adept with the glove. He was a part of most of UM's 68 double plays-- a UM record for that time in twin killings. 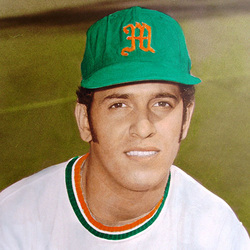 Gonzalez was drafted by the Cleveland Indians following his two-year stint at UM. It was with the Philadelphia Phillies and the Oakland Athletics, though, that he played at the major league level.